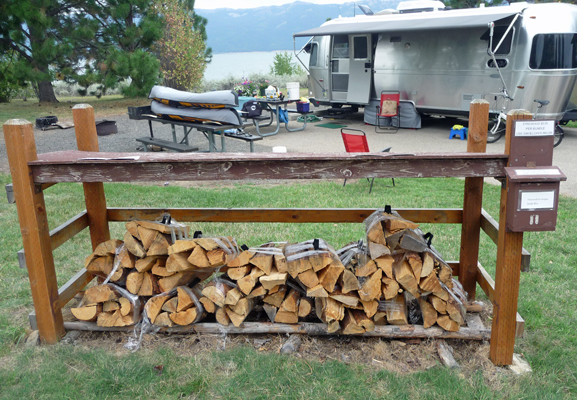 We hosted at Sugarloaf Campground at Lake Cascade State Park in Idaho for 6 weeks (July 15th to August 31st) and thoroughly enjoyed ourselves. Sugarloaf has an automatic sprinkler system so we didn’t have the watering duties we had at Buttercup Campground but the sprinklers were not without their own challenges since they had a tendency to malfunction and we had the remains of problems created by the renovation of the Sugarloaf boat ramp to deal with. Sugarloaf is known as the fisherman’s campground because many of the Bass Tournaments on the lake are held here so on the weekends the boat ramp is often full. 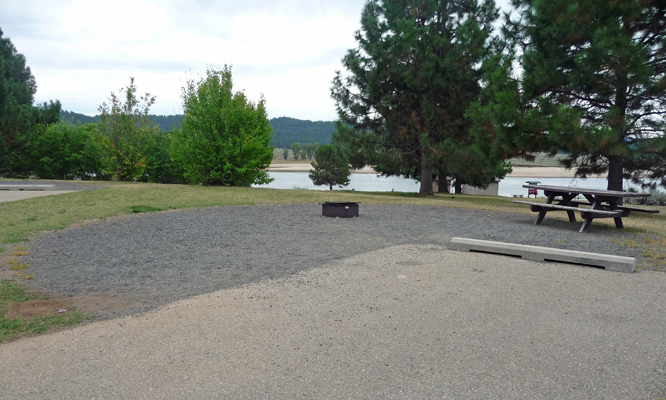 The campground is perched on a hill overlooking the lake so it has lovely views from many of the campsites but the hills make getting around the campground more work than at one of the flat campgrounds like Buttercup. The irrigation system was installed very shallowly so it’s very easy to puncture the pipes with a tent stake so tents are not allowed on the grass. 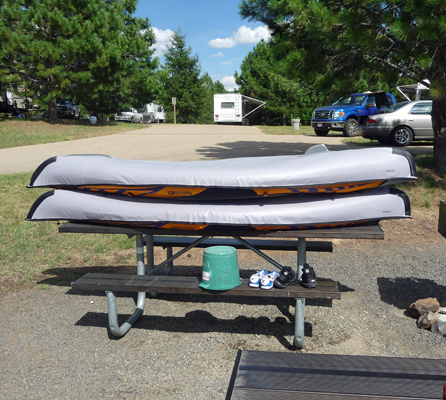 There are no tent pads per se, instead just a large gravel area near the end of each site’s paved parking area. This is not the best medium for pitching a tent on. So, one of our biggest challenges was getting folks to not pitch their tents on the grass. Only on the warmest evenings did we have any problems with noise and folks settled down quickly when reminded that it was indeed after 10 pm when quiet hours began. 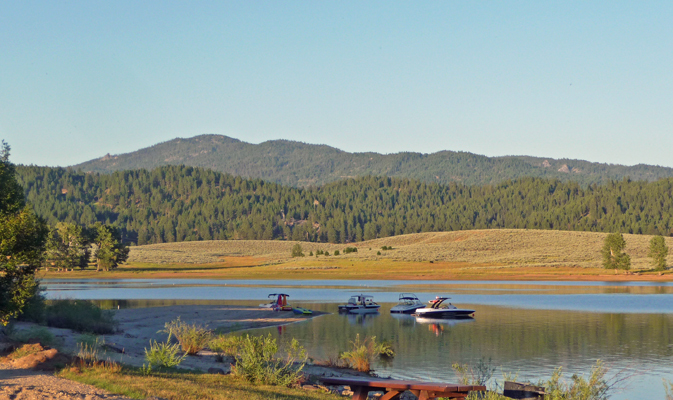 Unlike the other campgrounds that are clustered on the west and south sides of the lake, Sugarloaf is set apart by itself along east side of the lake. That means that the rangers were not as close by on Friday and Saturday nights as they were at Buttercup. So we did a bit more of the patrolling for noise control here than we did at Buttercup. We oftentimes only saw the ranger once in an evening if that. Because of that I wouldn’t recommend hosting here if you feel as if you need to have a ranger nearby you can call on quickly. They are happy to come but are often almost 10 miles away down in Cascade. 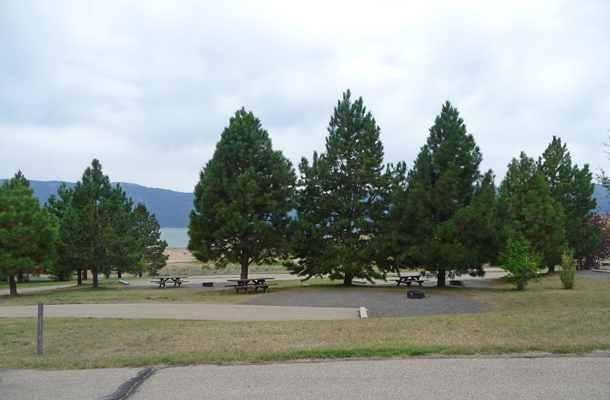 Lake Cascade State Park is a collection of 11 campgrounds spread around 20 mile-long Cascade Reservoir (known as Lake Cascade by the locals). 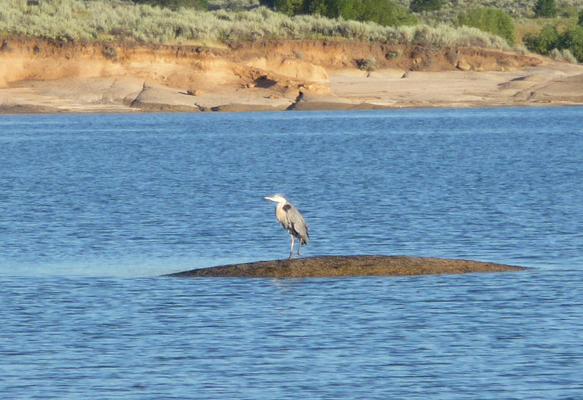 The campgrounds were originally developed by the US Bureau of Reclamation and then made into a State Park in 1998-99. 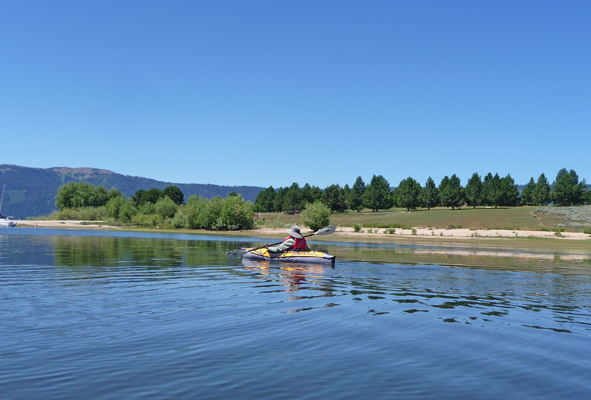 There are 5 campgrounds (and a Group Yurt site) plus 3 Forest Service campgrounds on the west side of the reservoir. There are 6 campgrounds (and a Group Use site) on the east side of the reservoir (plus two Day Use Areas). Because of all of these campgrounds and day use areas, Lake Cascade State Park has a lot of openings each year for camp hosts. We worked the first session at Buttercup Campground and then moved to Sugarloaf for the second session on July 15th. 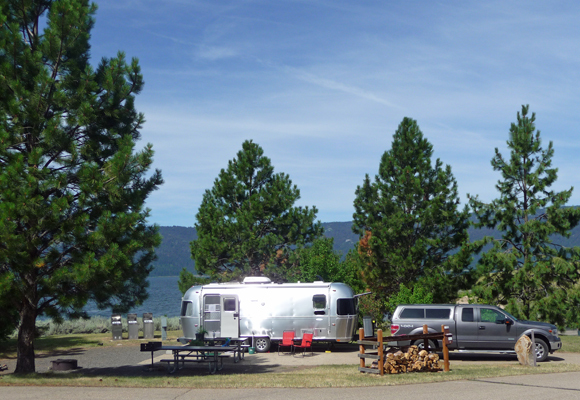 We left early because we were already committed to work in September and the first half of October at Hilgard Junction State Park in Oregon when we were contacted by Lake Cascade. They were happy to have us even if we were leaving early (and in our case we arrived late for the first session because we worked at Heceta Head Light House on the Oregon Coast in May). Sugarloaf has 44 sites in addition to the Camp Host site. One of those sites is set aside as an administrative site that is used when the reservation system burps and puts two parties in the same site. So there are 43 sites available in the campground. Only the host site has electricity, water and sewer. All the other sites have no hookups though each site is nicely paved and most are fairly flat. There are only 7 water stations though 6 of them have two faucets on them so it can be a hike for some folks to get water. Most of the faucets are set up so someone can hook a hose to them to top off their RV water storage tanks though, which is nice. The grass here is kept green by an automatic sprinkler system but it is still fairly sparse because for many years the system didn’t work well at all. 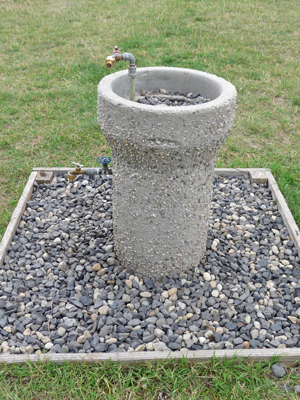 If the sprinkler system is shut down there is not enough water pressure to run more than one rainbird at a time so having the host water the campground is not an option. The sprinkler system has nearly 90 zones with an average of 8 sprinklers per zone so there are over 700 sprinklers in the system. It runs Monday through Thursday from 7 am until mid-afternoon. There are lots of trees at Sugarloaf but none that are very large mature ones. All of them appear to have been planted back in the 80’s when the campground was developed. It is not terrain that trees naturally grow on (this is sagebrush country) so they struggled for many years. They are no mostly 20 or so feet tall and provide shade to many of the campsites but their lower branches are also present so they obscure the views in some spots. You can’t put your tent up on the grass here, so this is not a popular campground with tenters. 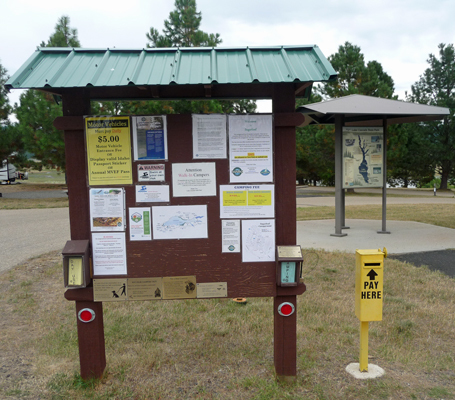 It is the biggest of all the Lake Cascade State Park campgrounds and it usually fills last in the reservation system each weekend. That means we often had folks with tents who had never camped here before who were unhappy to discover that they had to set up on the gravel. The gravel areas vary in size and the fire circles a placed fairly randomly in the gravel area. So folks with very large tents would run into problems fitting the tents on the gravel—many people in Idaho seem to have very large tents by the way. When folks would complain we’d tell them that they should plan ahead and get a reservation at Buttercup, Huckleberry or West Mountain where they would be allowed to put their tents on the grass. There is LOTS of beach at Sugarloaf especially as the season progresses. There is a nice little bay near the entrance of the campground which shrinks as the lake drops but still provides nice beach access. There is a sand spit to the east of the boat ramp that provides a sheltered area for children to play and folks to pitch their umbrellas. It is a hike from any camp spot to the beach since the campground is set up on the hill. Folks tie their boats up in the inlet east of the boat ramp but they need to be careful of the wind coming up and driving them onto the sand spit. Boats with very little draft, like this sailboat can figure out ways to tie up and stay moored no matter what the weather is. This boat was moored out on the shallow side of the sand spit and then moved out into the main channel and managed to stay there until late August. 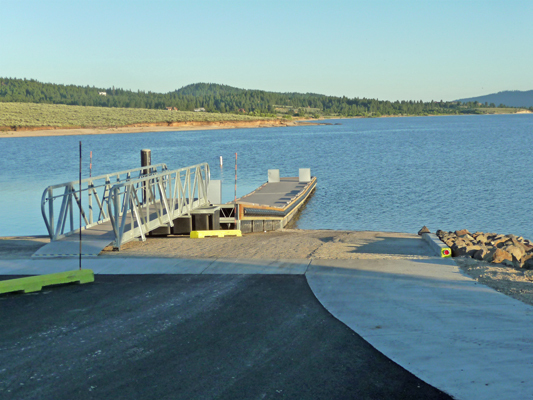 The boat ramp is down below the campground and provides good launching until late summer. In 2015 the drawdown of the lake was way ahead of normal and the boat launch became difficult for large boats on August 21st. By that point the only boat launches still able to handle most boats were Blue Heron and Poison Creek. Most years this occurs well after Labor Day. They closed the boatramp on August 27th when the water at the edge of the ramp was only about a foot deep and you had to get the back wheels of a boat trailer off the edge to get even the smallest boat launched. 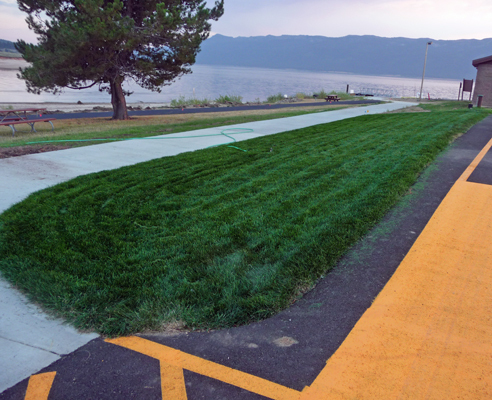 The boat ramp and the attached parking lot were redone the summer of 2015 with improved disabled access and a loading dock that goes down the middle of the ramp to provide two narrow launches rather than one wide one. Most of our users said it was a great improvement over the old launch and parking lot. 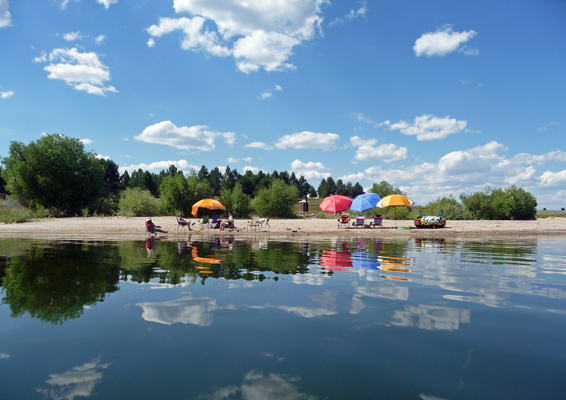 All the sites in the campground are reservable and once it gets hot in Boise, the campground is pretty much reserved each weekend but fairly open during the week. It is the last campground to fill most times (even when there’s a bass tournament) but it still usually fills most weekends until school starts again. The boat ramp parking lot is full most Saturdays both with folks who are camping and with the locals who favor the boat ramp. There is good kayaking in the back bay. 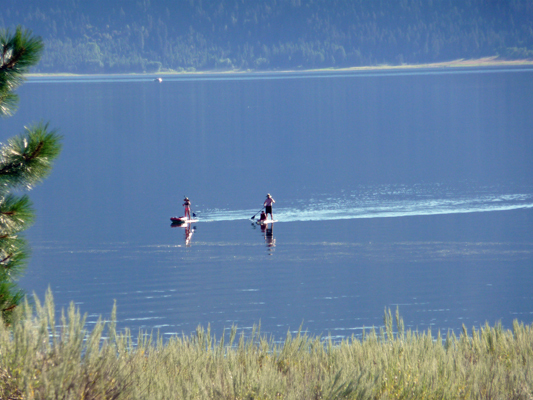 Folks regularly launch their SUPs (Stand Up Paddleboards) here and head out across the lake. As camp hosts we were responsible for greeting the campers and answering their questions; keeping the reservations tags up to date on each site; picking up litter all over the campground and boat launch; checking the bathrooms for litter and toilet paper twice a day and watching over the irrigation system. People aren’t required to check in with the camp hosts when they arrive but we tried to at least stop by and say hi and ask if they had questions sometime within the first few hours of their arrival. We weren’t responsible for enforcing rules but we were asked to inform campers of leash requirements, not pitching tents on the grass, quiet hours, payment of extra car fees and any other rules folks seemed to be breaking (riding ATV’s in the park, parking on the grass, having too many tents or cars in a site). On the weekends, we were asked to keep a record of the license plate numbers of all the vehicles in each site and whether they had Idaho Passport stickers. This could take an extra trip or two around the campground on Friday evening to get everyone checked in but otherwise it was no big deal. We learned to use our bikes to ride around the campground and that cut down on the energy expended. Our campsite was right at the entry of the campground so we could see folks as they drove in and out. But the registration kiosk was up next to the rest room well out of our view. 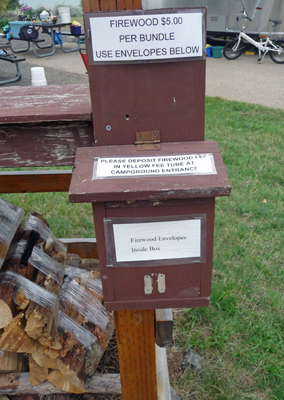 The firewood sale bin was at the edge of our campsite however folks had to put their money in an envelope that then needed to be placed in the pay tube up by the rest rooms. The sign said the pay tube was by the entrance. This caused a LOT of confusion for folks and of course a number of the envelopes ended back in the amongst the empty envelopes every weekend. We’ve put in the suggestion that they install a pay tube next to the wood bin, in hopes of more folks actually paying for the wood they take. We didn’t collect money or provide change either for wood or camping or day use charges. But we could call in on the radio and have a ranger come and provide change or process charge cards. We also helped walk in campers figure out the cost of their site (and cars) and could call into the office to see if they could stay extra nights. Every day we received an updated list of the reservations for the next 7 days. On Monday’s I’d wipe the dry eraser marker off each tag and write in the next week’s reservations. Then when the updated list arrived I’d just need to double check for additions and cancelations through the weekend and make changes to the tags as needed. The tags are riveted to the numbered posts at each site. That makes cleaning them off a bit of a challenge (I call it praying to the reservations tags) since you have to squat or kneel down 43 times in the hour or so it takes to clean the tags. My creaky knee was always crackling by the time I was done. When we got to Sugarloaf I found that the previous host had left me a microfiber cloth to clean off the signs. It worked way better than the paper towels I’d used at Buttercup. We’d do rounds twice a day: once in the morning and once in the evening. Walter would walk the route and pick up trash with his “easy reacher” at least once a day. 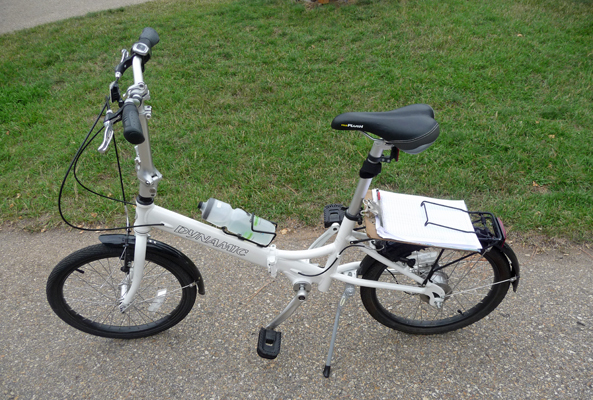 The other time we’d ride our bikes and stop and talk to folks and check the restrooms. At least once a day, we’d take a tour of the boat ramp too. Walter would also police each site after people left—especially looking for trash in the fire pits. For reasons beyond me, people seem to think that fire pits are trash receptacles and then try to burn everything including aluminum cans and plastic and glass bottles. Ugh. We were also responsible for cleaning excess ash out of the fire pits but we only had one fire pit to clean out in our 6 weeks at Sugarloaf. 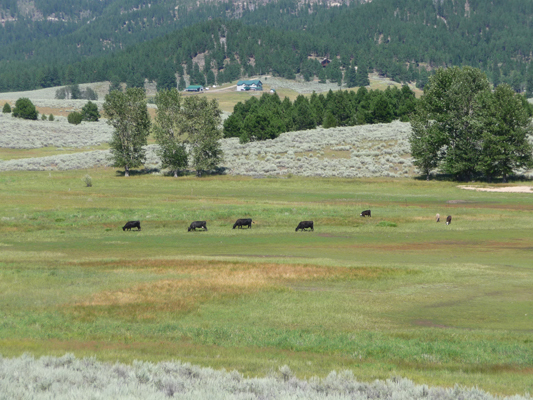 For the first few weeks there were cattle across the back bay from the campground. We’d stop on our rounds and check to be sure that they stayed on their side of the fence. Of course one week, they managed to find a way around the fence and we had to call in and let the office know. After a few days we’d gone from a couple of cows to 10 and they finally got the owner to come out and work on the fence. 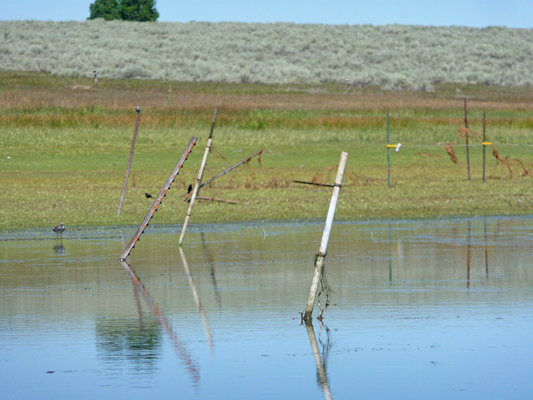 After a few more weeks the lake had dropped enough that there was too much fence that rose out of the lake that needed repair so they moved them to another pasture and we had one less thing to worry about. Since the seasonals came and cleaned at Sugarloaf first thing in the morning we didn’t find it necessary to check the bathrooms on our morning rounds. But in the evening we’d always stop and check the toilet paper situation in each of the bathrooms in the campground and over at the boat launch (picking up paper off the floor and making sure the lids were down and adding toilet paper when it was out). Our biggest challenge during our stay here was provided by the contractor who was still working on the renovation of the boat ramp. He did things like installing a patch of sod on a day it was 90 degrees and then leaving us with no irrigation system with which to water it. Instead we used one hose and one Rainbird (because the water system for the faucets in the park doesn’t have enough pressure to run two Rainbirds at once) to water the patch of new sod. It took two positionings of the sprinkler to get it all covered and for the first week we needed to water it three times a day since it was in the high 90’s. Nine trips to the boat ramp resulted in us using our truck to make some of the trips each day. We ended up tending this sod up until we left because one of the sprinklers that was supposed to water the sod didn’t work so even once the irrigation was working we still needed to water one spot. And then the last week, the lake had dropped so much that the automatic sprinkler system had to be shut down. The ranger in charge of the irrigation was also a challenge. He didn’t train us on anything about the system and in the end we found the user’s manual on line and taught ourselves how to deal with the control system. We never did learn how to deal with the many different kinds of sprinklers that would malfunction which we might have been able to fix with a little instruction. We decided that not only were his communication skills lacking but that he was protecting his knowledge about the system in an effort at providing himself with job security. He gave us only the most minimal instructions and didn’t want to use us to help him tend the system. The documentation for the system was inadequate and we would have been happy to go through and create a new map of where the zones were and how many sprinklers there were in each zone. But he declined our help. He was also not very responsive to our complaints regarding malfunctioning sprinklers. Over our 6 weeks we reported many malfunctioning sprinklers and only the two that were catastrophic failures (geysers really) were repaired. Over time we began to consider him the only real drawback to hosting at Sugarloaf. The irrigation system itself has over 700 sprinklers and nearly 90 valves so something was always going wrong. The water for irrigation comes out of the lake and the intake had to be moved further out into the lake twice during our stay to keep it from sucking weeds and mud. Meanwhile, the system would be shut down while we waited for that to happen. The other rangers and managers at this park are simply wonderful. They are appreciative, supportive and responsive. The staff in the office was always helpful and responsive too. The notebook for the campsite is well organized and has lots of information (and only a few things that were out of date in terms of our duties). They provided a box of literature to help answer people’s questions about trails, drives and recreational opportunities. Our name tags, hats and vests were waiting for us though we did have to wait a few weeks for our annual parking pass to arrive from Boise back when we began our shift at Buttercup. Once again there was no documentation or instruction on dealing with the irrigation here just as the information at Buttercup had been inadequate. But we figured it out and learned to cope. The host site at Sugarloaf is excellent. There are trees that provide shade in the afternoon. There is a nice water view and a large level area with two picnic tables, a bar b que and a firepit. It was a much nicer living space than we had at Buttercup. The view from our rear windows was lovely. The hitch was the presence of both a large number of ground squirrels who dug tunnels all over the park and the lawn near our site (we counted up to 6 of them at a time out in the grass) and a little rodent called a vole who made its home in the grass near our sewer hookup. There were many of these and they took up residence under one of our boats when we stored it in the grass for a few days. We learned to keep the boats up on the picnic tables to keep them away from the critters. 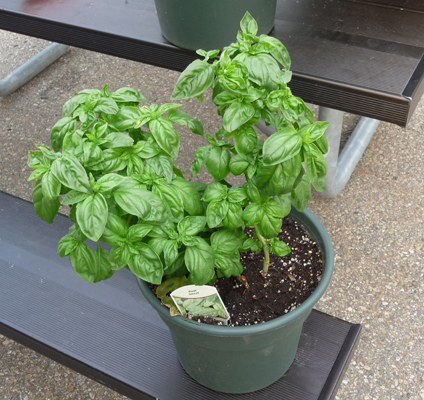 I learned to keep my plants up on the tables too since they completely annihilated my flower basket, basil plant and parsley plant in just two days on the ground. 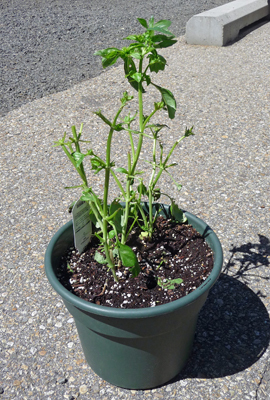 My plants recovered just fine and were unharmed as long as I kept them up on the metal tables. The drinking water was fine and had no excess minerals to make it difficult like the iron at Buttercup. People fished some from the banks here but were most successful from boats. That was mostly because by mid-July the level of the lake was low and the water near shore was very warm. Swimming was very good here and people enjoyed the water. 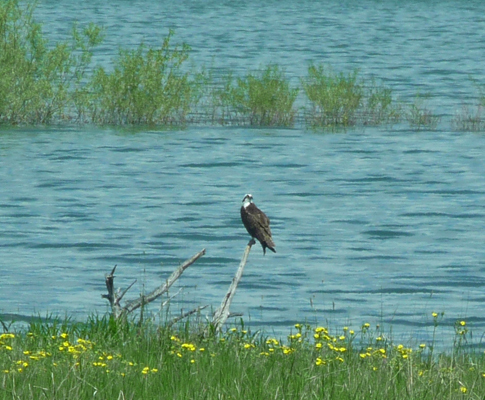 The birds at Sugarloaf are amazing. 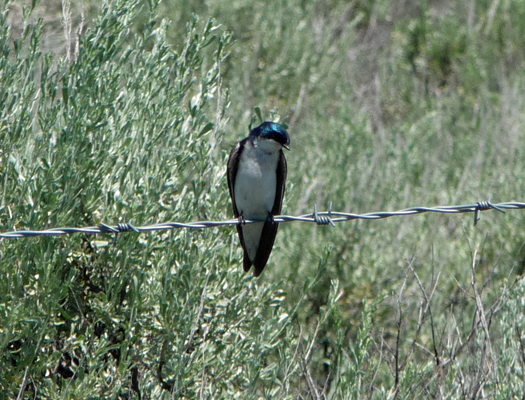 On the 2-mile drive from Highway 55 to the campground where there are nesting boxes along the shore, we regularly saw osprey and tree swallows. 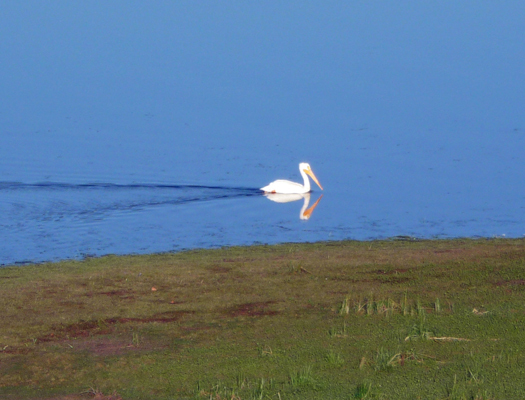 The back bay was home to Great Blue Herons, white pelicans, and several types of sand pipers. We spied a pair of sand hill cranes there the first week too. 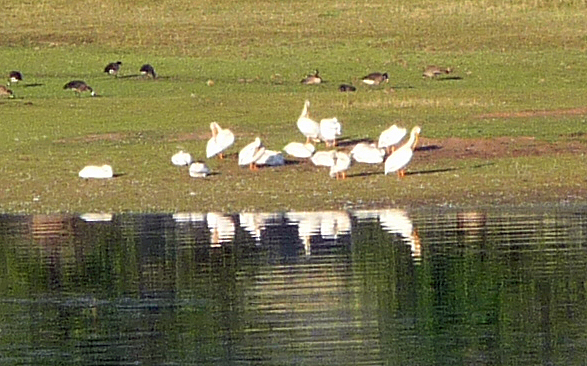 Sometimes the pelicans would gather in large numbers along with LOTS of Canada Geese. The flowers were pretty much over by the time we got to Sugarloaf but given the terrain I don’t think they were ever special here. But the sunsets were superb in all directions. Even though it is only about 7 miles to the town of Cascade and nearly 20 miles to McCall from Sugarloaf we continued to go to McCall to shop. There are two very nice grocery stores, an Ace Hardware, an inexpensive laundromat and a Rite Aid in McCall so we oriented that direction. There is a laundromat in Donnelly too which is only 7 miles away and equally nice and inexpensive. Cascade has a small grocery store and a laundromat too if you don’t want to go that far but the grocery store wasn’t up to my standards. 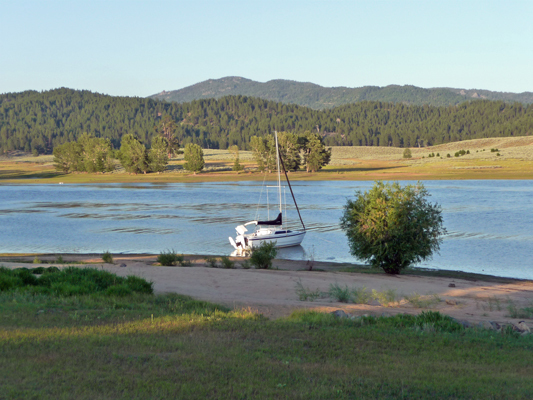 We like McCall a lot and have enjoyed Payette Lake and Ponderosa State Park on our days in McCall doing errands.